It will be limited to just 50 examples. The stunning Audi PB18 e-tron concept, which made its debut at Monterey Car Week in 2018, is getting the green light. Audi Global CEO, Bram Schot, in an interview with Autoweek Netherlands, said the all-electric supercar should show up sometime in the next year or two, though, just 50 examples will make their way to production. Color us excited. First Audi e-tron Deliveries In Germany Postponed To February? Details on the production version are slim. We know that three electric motors power the PB-18 concept, producing a total 671 horsepower (500 kW) and 612 pound-feet (830 Newton-meters) of torque. There’s an option for a brief 764-hp (570-kW) boost, as well. The concept can reportedly hit 62 miles per hour (100 kilometers per hour) in about 2 seconds – here’s hoping that impressive performance carries over to the production version, too. In terms of range, Audi promises a futuristic solid-state battery with a 95-kilowatt-hour capacity. Though, the technology itself is still a ways off, it would give the PB-18 a range of around 310.7 miles (500 kilometers) on the current testing scale. With an 800-volt charging system, the battery can reportedly be fully charged in just 15 minutes, with wireless charging capability. But the PB-18 concept’s piece de resistance is its interchangeable driving position. Like the McLaren F1, the steering wheel is in the center – but unlike the McLaren, it’s movable left or right, depending on driver preference. Again, we’re not sure if this wild option will carry over to the production model, but it looks cool on the concept nonetheless. Price remains a mystery, as does its on-sale date. But based on the seemingly road-readiness of the concept (at least on the outside), the production model shouldn’t be too far off. We hope. 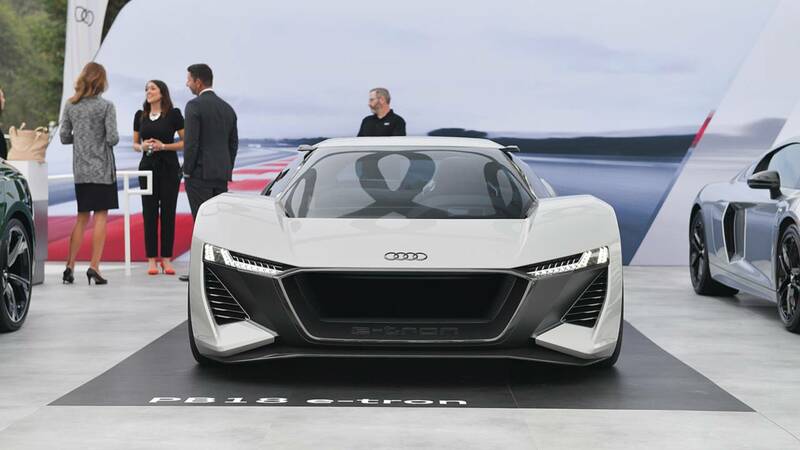 15 Comments on "Audi P18 E-Tron Supercar Confirmed For Limited Production"
VW has. They invested in QuantumScape years ago and recently bought a majority stake in QuantumScape. They announced that they do now have access to solid state batteries and they are testing them at the automotive scale. So not in a car yet but a battery pack for a car in a simulation rig. They are building production capacity for small series volume right now. They announced this to their shareholders so there must be some substance there else they will be liable. This is only 50 cars production and most certainly very expensive. Thus they don’t need solid-state batteries in mass production or at competitive cost to pull this one off. No holy grail yet. > outside), the production model shouldn’t be too far off. Let’s apply that logic to the new Tesla Roadster back when it was unveiled, shall we? Unveilled with a road-ready prototype: November 2017; production… maybe two years later, if we’re lucky. I know Tesla is a unique case so the comparison may be irrelevant, but my point is simply not to expect imminent production based on a single road-ready prototype. There is a difference: One will be “mass” produced, the other one not. Audi won’t have to build a production line for the P18 since 50 pieces are easier hand built. So the very important step to optimize your design for prduction lines, streamline production processes and automate as much as you can can be left out. Tesla aims for a 200k$ price range, so will have to have a meaningful number of cars produced. For comparison, the Porsche 918 was produced about 1k times and still cost around 1 Million. The P18 will fall into the same price range and thus can be hand built piece by piece. About the same Vaporware rating as the Tesla Roadster and far less vaporware’ish that the imaginary Telsa pickup, since we can actually see this one drive. Regardless the performance or battery technology, all 50 will be sold in few days and the owners will storage these as collectors items. Tesla Roaster will be many people’s day to day car, and will see it more often on the street. The limited production may be due to the extremely short battery range……. I remember that VW Group confirmed that they tested a solid-state battery in QuantumScape last several years. This implies that they have a solid-state battery technology right now. The problem is that it is prohibitively expensive for a mass-produced product. It makes sense for them to offer limited production cars (50) with this marvelously advanced battery technology. It looks like VW Group is leapfrogging Tesla. Already.